Fox News asks Rand Paul if Reid is right to "call Americans" "Domestic Terrorists"
Not since George W. Bush complained that the problem with the American economy was that “too many of our imports come from abroad” has such hilarious use of the English language been on display. 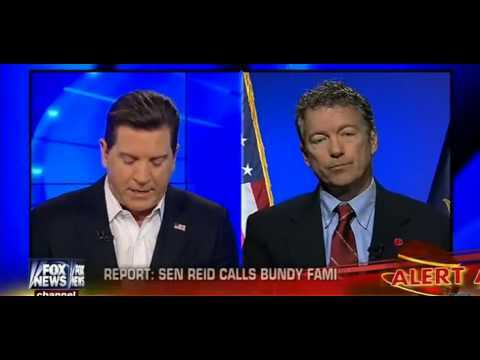 The furor on the Right about Harry Reid terming “domestic terrorists” the militiamen who brought sniper rifles across state lines to confront the Bureau of Land Management produced the following interview by Fox News of Rand Paul. If you meant to ask whether there are any domestic terrorists, I think Timothy McVeigh might be an answer to your question. So, yes, there is sometimes a reason to call Americans domestic terrorists. When they are. Reid said he hadn’t been referring to Cliven Bundy, the deadbeat cattle rancher, himself when he spoke of domestic terrorists, but the armed militiamen who interfered with the confiscation of Bundy’s cattle for non-payment of fees. It should be noted that deploying firearms to interfere with the Bureau of Land Management officers is a felony, and that crossing state lines (as many of the militiamen had done) with firearms in order to commit a felony is a Federal offense. “Imagine that the Bundy ranching family in Nevada, instead of being white and Mormon, are all black and Muslim. And imagine that they, too, believe not only that the federal government should have no jurisdiction over the public land adjoining their ranch, but also that a second revolutionary war should topple the U.S. government. Imagine that, just like Mr. Bundy, they lost two court decisions and are expected to either pay one million in overdue fees or have their cattle seized to pay the debt. Imagine that they send out a call, via Facebook and Twitter, for all like-minded thinkers to take up arms and prepare to fight the agents sent to collect the cattle. How would the media describe some 2000 black, Muslim men, armed with automatic rifles and shotguns, who drive from all across the country to show up in Nevada ready to kill government officials? How would the media portray those black, Muslim men when they used their guns to shut down I-15, a major interstate freeway, forcing hundreds of travelers to bake in the hot desert sun until the road could be re-opened? What would right-wing pundits say about those black, Muslim men who were crouched on overpasses training their sniper sights on the cowboys and drivers hired by the federal government to move the cattle? Would they agree with those black, Muslim militants who planned to put their wives and girlfriends on the front lines so there would be news footage of federal agents shooting women? Would Nevada politicians, senator Dean Heller and Governor Brian Sandoval, still throw their support behind a Bundy who said, “. . . I don’t recognize the United States government as even existing,” if he were Muslim and black? Try as hard as I can, I can’t see people on the right using any word other than “terrorist” to describe homegrown, black, Muslim militants who are willing to use violence to support their belief that the U.S. government is meaningless.